Updated: January 2019 with latest suggestions and revised commentary. Updated: May 2016 with new cipher suggestions and revised commentary. 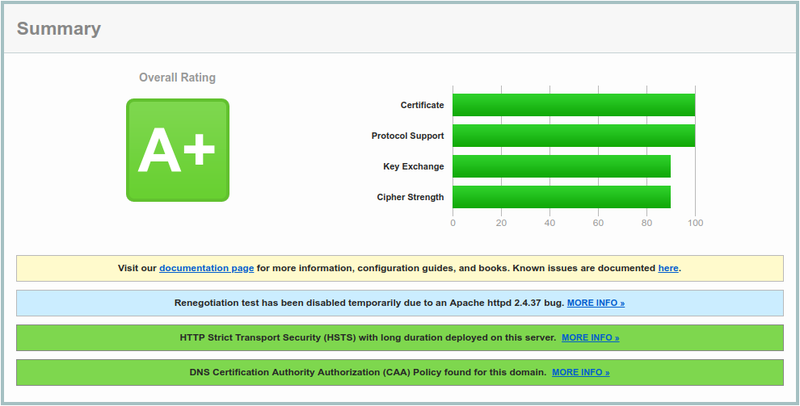 We routinely use SSL Labs to verify systems we’ve configured. It’s a great service to verify that an SSL configuration is reasonably secure. It scores a site in four different areas: Certificate, Protocol Support, Key Exchange, and Cipher Strength. A perfect score is theoretically possible, but isn’t practical because many client/OS combinations couldn’t connect to your site. How do you maximize your score with a configuration that still allows nearly universal access? 1. Maximize the overall score from SSL Labs. 2. Ensure Forward Secrecy on the maximum number of clients. 3. Given #2, use the most secure cipher on each client. We do allow AES128 as current thinking is it’s not less secure than AES256. You can drop this yourself by changing “AES” in our cipher list to “AES256”, but be aware that you will then drop some clients from AES128 to 3DES. You may have PHBs demanding “256 bit encryption”: Our cipher ordering keeps 256 preferred over 128, so clients that support 256 should be using it. We have further tweaked this cipher selection and ordering to support HTTP/2 in Firefox and other major browsers. If you have any suggestions for improving this, or have configurations for more applications than we’re currently listing below, please comment and share! You must be using OpenSSL 1.0.1+ to support TLS 1.2. If your distribution isn’t shipping this, it’s time to consider a new distribution. If you’re not using a distribution that supports ECDHE, follow our article on compiling your own copy of OpenSSL here. Run away! SSL Labs agent capabilities list that all current browsers on all current operating systems support TLS 1.2. Warning: Many large legitimate mail servers do not support TLSv1.2 yet, even in 2019. SSLCipherSuite "ECDHE+AESGCM ECDHE+AES DHE+AESGCM DHE+AES"
- "ECDHE+AESGCM ECDHE+AES DHE+AESGCM DHE+AES"
Use your browser, mail client, xmpp client and SSL Labs to test your new configuration. Do not make changes without testing – one typo can break your service. Review the entire set of test results carefully. Pay special attention to the Handshake Simulation section, where you can see which browsers will have problems connecting to your site. SSL Labs won’t give you an A+ without Strict Transport Security enabled. You’ll only want to enable this on domains where the entire site is expected to utilize HTTPS and you never want a browser to connect using HTTP. IN CAA          0 issue "letsencrypt.org"
I wish I’d found this guide before POODLE. Easy to follow and works perfectly – thanks! What error do you receive? I haven’t heard of any problems yet. I’m on FF 33, but don’t have an OS X 10.9 system around to test with. ssl_prefer_server_ciphers was added in 2.2. There is a patch to add it in 2.1.